Place chiles in a small bowl and cover with boiling hot water. Let it soak for 10 to 15 minutes. Places chiles in the blender along with 1/2 cup of the soaking liquid, onion and garlic, and puree until smooth. In a mixing bowl, combine the ground beef and veal. Add the chile mixture, two lightly beaten eggs, salt and pepper. Mix until it is all well incorporated. Heat the grill or pan over medium heat until very hot and brush some oil. With your hands, mold the patties and place them on the hot grill or pan. Cook for about 4 to 6 minutes per side, depending on how well cooked you like your burgers. I like them medium-well, so it is about 5 minutes per side for me. Place the garnishes on the table so that everyone can choose to their liking. To make the lime aioli, place everything in a mixing bowl, and just mix it all up! 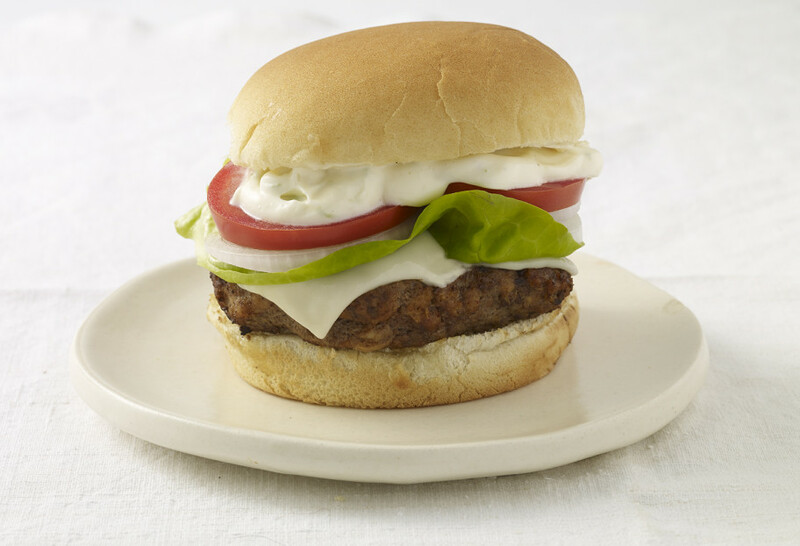 If you want to make this hamburger into a cheeseburger, Monterey Jack is a great companion. Just place a slice of cheese on to the patties once you flipped them on the pan or grill and let it melt as it finishes cooking.